Order a mixture of brown egg laying chickens and white egg laying chickens in this assortment. We include the most readily available chicks in this assortment. Availability: $5.99 per chick. Chicks from this assortment will hatch and ship within two weeks of placing your order. 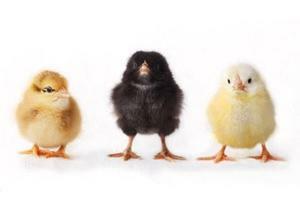 This assortment will include as many chicks as you choose to order that are hatching and shipping as soon as possible. Chicks from this assortment will hatch and ship within two weeks of your order, it will include a mixture of brown egg layers and white egg layers. It is intended for customers who want to receive their chicks as soon as possible. We include the most readily available chicks in this assortment., and we guarantee that your assortment will include at least 3 different chicken breeds. This assortment will include our most popular and readily available chicken breeds.